The past month has been a whirlwind of travel for Dr. Isa Sarac, President of Virginia International University. Dr. Sarac visited several Asian countries, where VIU has a wide range and business, academic and collaborative interests with local institutions and organizations.His first stop was in Tokyo, Japan, which has recently won the bid to host the 2020 summer Olympics. Dr. Sarac enjoyed his trip to both Tokyo and Kyoto city, where he met with EducationUSA representatives, as well as seeing magnificent historic towns, cityscapes, hot springs and beautiful traditional arts. After four days in Japan, Dr. Sarac headed to Ulaanbaatar, Mongolia, where he had been invited by Royal Academy, one of VIU’s partner institutions. VIU’s collaboration with Mongolian Royal Academy spans more than two years and includes many opportunities for student exchange, with several students completing their bachelor’s and master’s degrees in the United States every year. Both institutions are committed to providing the best possible experience for their students, and, as such, continue working together closely. 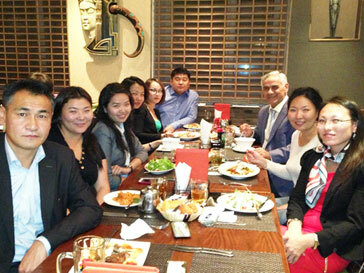 While in Ulaanbaatar, Dr. Sarac was again impressed by Mongolian hospitality. Mr. Uchral, Director of the Royal Academy, provided a big welcome for Dr. Sarac, who has several speeches about VIU, the American education system and how both students and institutions benefit from their collaboration with VIU. The most common questions were about studying in VIU, getting scholarships and student life in the United States. At his speeches at the Royal Academy and the Ikh Zasag International University, Dr. Sarac stated, “Everybody who wants to study at VIU in the United States has to learn English well, first. That way, you will feel comfortable when you arrive in the United States. Once you earn your degrees and learn from your professors and peers, you may go back to your countries after graduation, as many of our students’ do, to contribute to their countries’ development.” While in Mongolia, Dr. Sarac was interviewed by several newspapers and television stations and met with a variety of people: the VIU alumni in Mongolia, directors of the Mongolian Turkish School, and Mr. Nyam-Osor Namsrai, President and Founder of the Ikh Zasag International University. Besides the speeches, business meetings and appearances, Dr. Sarac also enjoyed the cultural landmarks of Mongolia, going to visit the Genghis Khan Equestrian Statue, the Tonyukuk Monument in Terelj, and the Zaisan memorial. The results of his trip were quite valuable, as both side agreed on ideas for further collaborations and on how to evolve technologically and academically. Dr. Sarac’s final stop in his Asian trip was in Taiwan, otherwise known as the “heart of Asia.” He was impressed by Taiwan’s towering mountains, rising over 3,000 meters above the sea, as well as temples, national parks, museums, night markets and factories. “People in Taipei drive more motorcycles than cars – everywhere you go, you see motorcycles!” president said. While there,Dr. 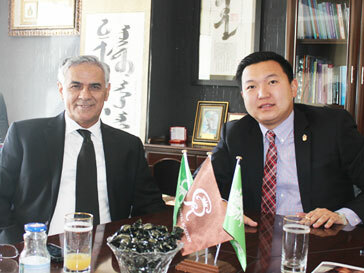 Sarac met with the Directors of the Taiwanese Turkish Center and discussed collaboration opportunities there. Our president’s three-week trip to Asia was both fascinating and extremely productive for Virginia International University, expanding collaborations and giving VIU students the best possible experience. As the President prepares for his next trip abroad, we look forward to hearing more about his travels!